Livin on Diet Coke and a Prayer. I fell into the habit/addiction by my circumstances. In 2006, I gave birth to twins after a long battle with Infertility. They were born 8 weeks premature after a high-risk pregnancy that landed me in the hospital on bed rest for 12 weeks. Because they were preemies, I had to feed them around the clock every three hours. I would wake them up and feed them a bottle, which would typically take about 45 minutes because they were so weak. Clean Bottles. Pump. Clean Pump. Finally, I would lay down to sleep for about an hour and a half. And that was if I was lucky enough to fall asleep quickly…which never happened for me! So that is where my love affair with Diet Coke started. I was exhausted, desperately needed caffeine, and was not a coffee drinker. There were days that I felt like I needed an IV drip of that sweet, brown, bubbly goodness. And the fact that it had 0 Calories made me feel like I had 0 guilt as I was trying to shave off the baby lbs. As the kids started sleeping through the night, it got a little better. However, I still clung to my morning Diet Coke. And of course my lunch Diet Coke. And sometimes if I really needed a pick me up, my “going to pick up the kids from school” Diet Coke. Oh I am salivating just as I type this. The best ones were when I swung by Sonic to get them. There is something about their cups and ice that makes everything taste better. I was rarely seen walking into work without a Diet Coke in my hand. All that changed about a month ago. It wasn’t like a lightening bolt revelation for me. 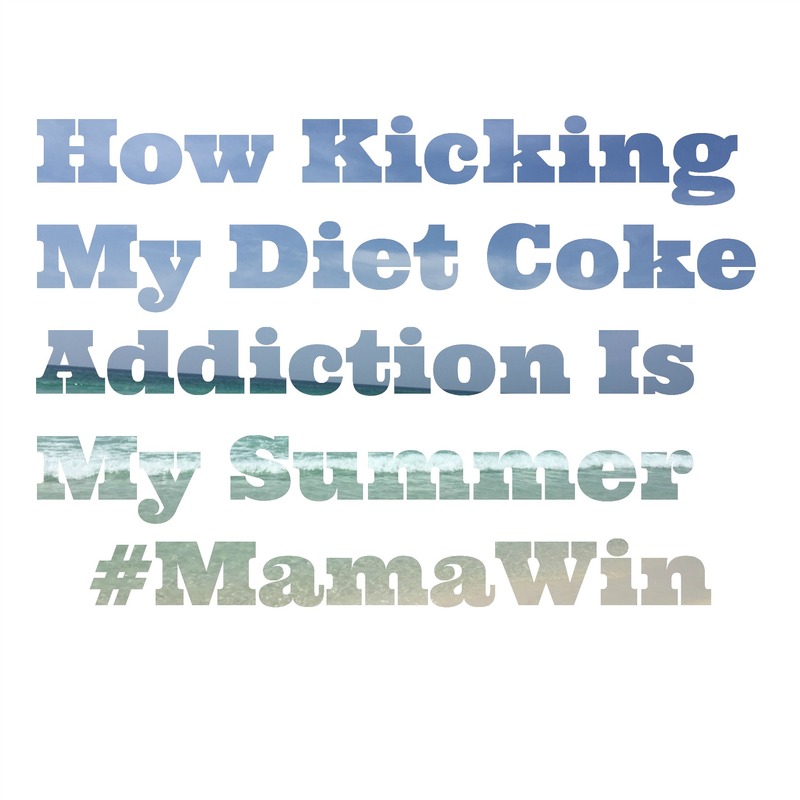 It was several things that worked together to help me break my Diet Coke addiction for good. Being Proactive. If I had a dollar for every time someone told me that their body changed once they turned 40, I could take my kids to Disney World. Maybe even fly. Maybe if I adopted some healthier habits now, 40 won’t hurt so much in a couple of years?? Better metabolism? Less Wrinkles? Worth a try! Water, Water and more Water. Drinking water has always been a chore for me. I think it stems back to when I was in the hospital in pre-term labor. The nurses would push water on me to help control the contractions. I was just about to fall asleep and I would hear over my speaker, “Stephanie, we need you to drink some more water. We’re seeing too many contractions on the monitor.” Every day. 12 weeks. Soooo I got a little sick of water. Since I had my babies, I pretty much only drank water when I was exercising. Seriously there were days when I only consumed Diet Coke and Chardonnay. Picture of health right here. As I have shared a few times, I got a Fitbit for my birthday. Honestly, this has been the best investment I have made in my health in a while. In addition to it encouraging more activity, it also helps me monitor my water consumption (or lack there of) on a daily basis. It became clear to me that there was no way for me to reach my daily water goal if I was nursing a Diet Coke every morning. The benefits to water consumption are proven. Why not choose a drink that actually helps my body instead of potentially hurting it? I am now easily able to reach my daily water goal by lunchtime. Practice What I Preach. Here’s the bottom line. I am a mom. One of my biggest responsibilities is to raise my children to know how to take care of themselves. I stood at our kitchen island every morning. I piled their breakfast plates high with fresh fruit and filled their cups with cold 1% milk. I preached to them about eating healthy and making good choices. Then I popped open my Diet Coke. Granted I was eating a very healthy breakfast too, but I lost all credibility with the pop of the top of that silver can. So here I am a month later and I have officially kicked my morning Diet Coke. I am not gonna lie. I completely fell off the wagon when we were on vacation. My sister and I were at the grocery and there was a Diet Coke that said, “Have a Diet Coke with Stephanie”. I mean come on now!!! A girl can only take so much temptation! I found my happy medium for two reasons. #1 – I gotta have caffeine some days, and I don’t drink coffee. #2 – I believe treats every now and then to help keep you on track and not give up completely. So my after trying several different things, I stumbled upon Coke Life. I had seen it on FB from a friend that works fo r Coke. It isa low calorie soft drink that uses natural sweeteners. It is the perfect treat to have in my fridge that I can indulge in on days that I need a little extra boost. Because the other thing I teach my kids is that occasional treats are great too! As hard as kicking my Diet Coke addiction has been for me, it has been 100% worth it. It has given me an opportunity to really talk to my kids about making healthy choices about their diets and taking care of the bodies that God gave them. It also showed them that Mama is a work in progress and that is okay!